During renovation a cabinet fixture was removed from this granite counter top. A deep set glue was covering the surface and needed to be removed. First, the glue was stripped off the stone counter and honed. 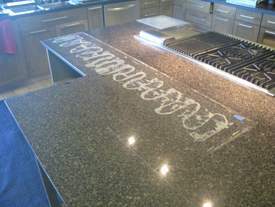 Polishing and sealing are the final steps in the stone counter repair process. Stone repair is a great option for stone surfaces that are cracked or discolored too. 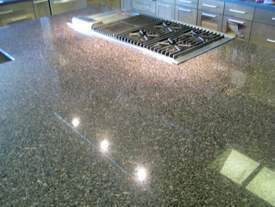 This granite counter top is shiny and ready for use!